Unless you live there, you may not know that Southern California has four seasons. But the only place to experience them is in Big Bear Lake. High in the San Bernardino National Forest, the Big Bear mountain town is a popular ski resort in winter. But Big Bear shines in the summer months! 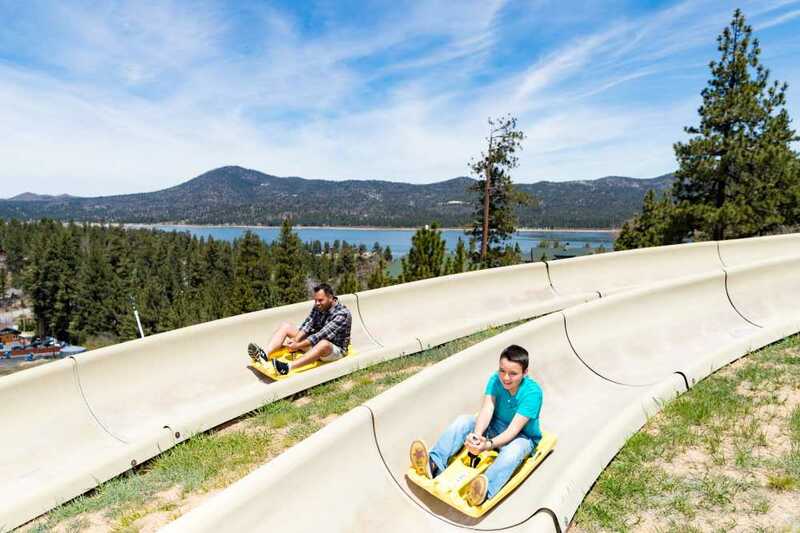 Here are the best things to do in Big Bear in summer, from leisure to active. 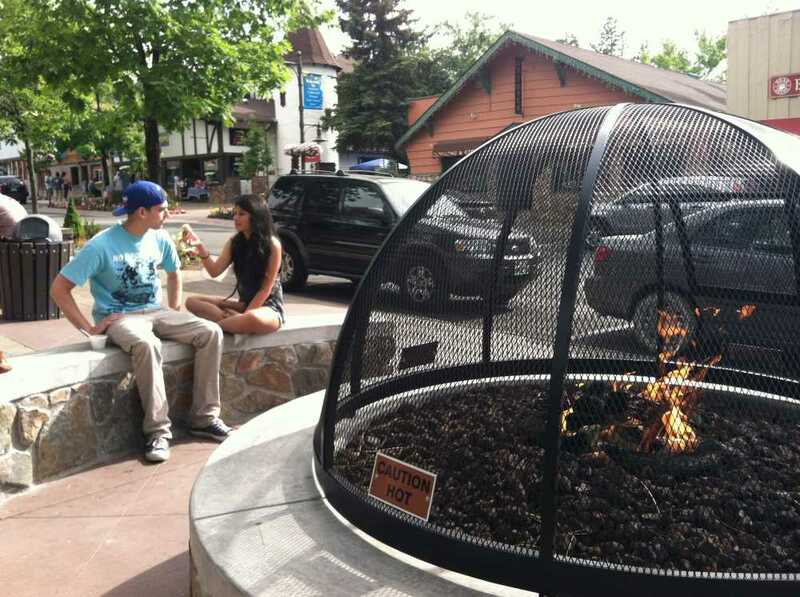 Big Bear is also pet friendly, so feel free to bring the entire family. No matter how many times we’ve visited Big Bear Lake, each trip is memorable. Summer is especially enjoyable with a range of activities to suit everyone’s interests. 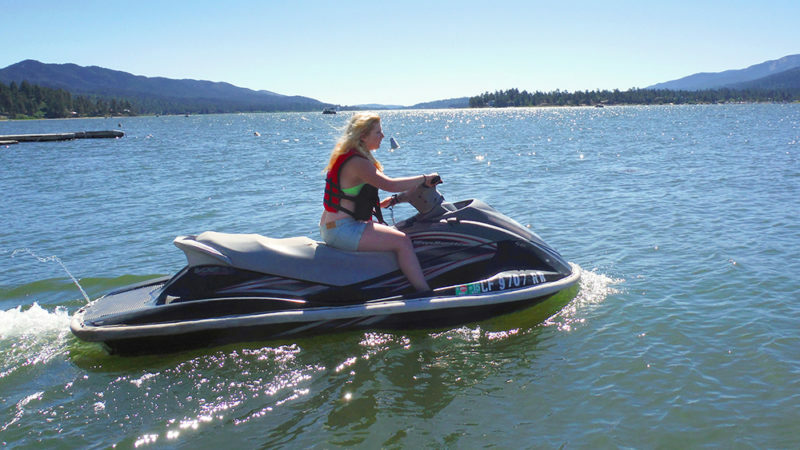 Because we bring our dog, we opt for a pet-friendly lakeside vacation rental over a hotel We usually book through Big Bear Vacations for both winter cabins and summer lakeside houses. Big Bear is only about a two-hour drive from anywhere in Southern California. Barring traffic, of course. Which means, avoid driving up on a Friday afternoon. 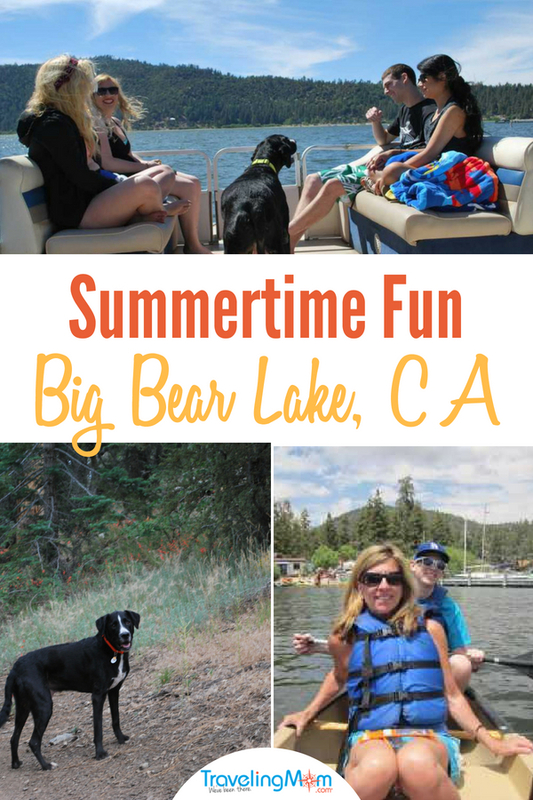 These are my family’s 7 favorite things to do in Big Bear Lake in summer. Icy blue in winter and sparkling in summer, Big Bear Lake is lovely year-round. But in the warm summer months, we love getting on the water. At the top of our list of favorite lake activities is cruising on a canopy-covered pontoon that we rent from Holloway’s Marina. It beats taking a boat tour! We pack snacks, bring our dog and skipper our own boat at our pace. 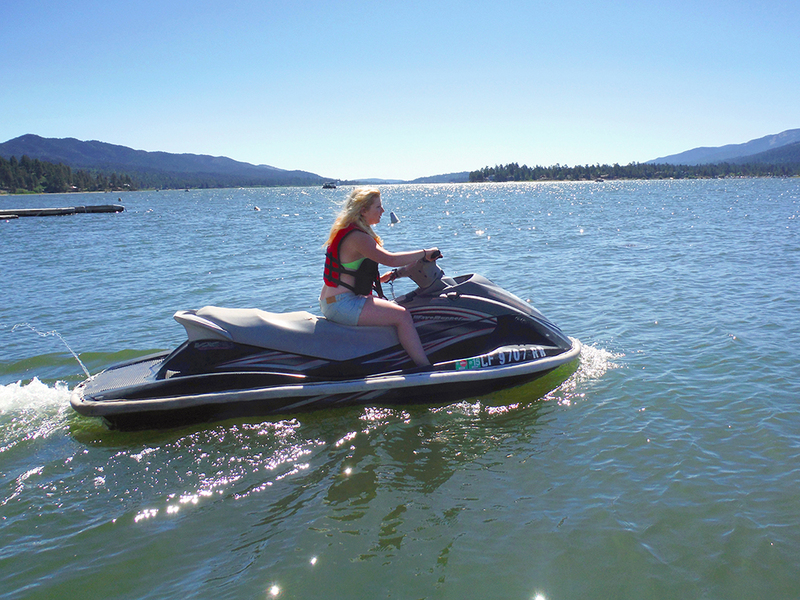 The lake is also where we tried jet-skiing for the first time at North Shore Landing. That was a blast! My daughter Megan took to it like a pro. Active water sports include SUP (stand-up paddleboarding), kayaking, canoeing, and wake-boarding. New this year is the Tarzan Boat at Capt. John’s Marina. The floating, jungle-themed waterpark features platforms, trampolines and a swing. Big Bear Lake is also a great place for fishing. Rainbow trout are most common, but you might catch bass, channel catfish and other species. Cantrell Guide Service offers fishing excursions for those who need a little help in catching the big one. Big Bear hosts fishing tournaments and derbies July through October. The Pacific Crest Trail spans 2,650 miles from Mexico to Canada through California, Oregon, and Washington. You can catch a portion of the trail in Big Bear. In fact, it’s one of our favorite hikes. At certain points you can see the shimmering blue lake through the trees. The trail is just one of many in Big Bear. 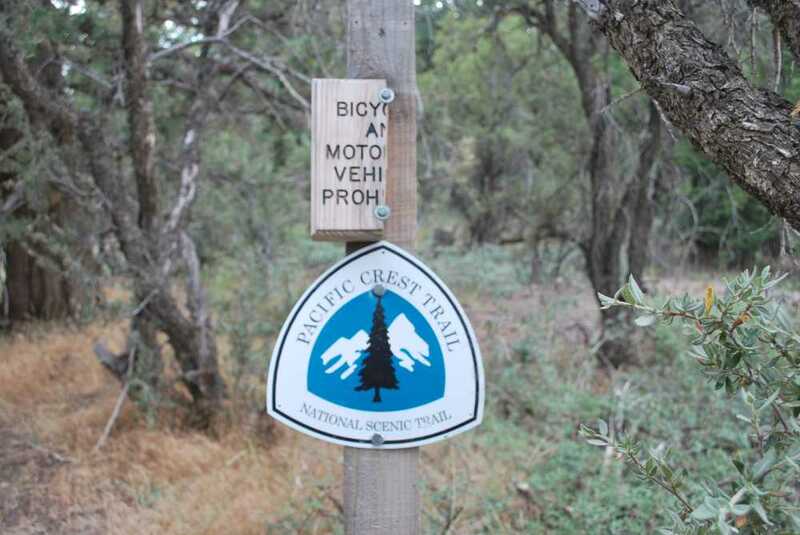 Grab a trail map and check out the more than 100 miles of hiking, horseback riding and mountain biking trails. In spring and summer, hiking trails bloom with colorful endemic wildflowers. Though Big Bear is home to black bears, bobcats and deer, you probably won’t see them unless you visit the Big Bear Alpine Zoo, a rehabilitation facility for injured, orphaned and imprinted wild animals. 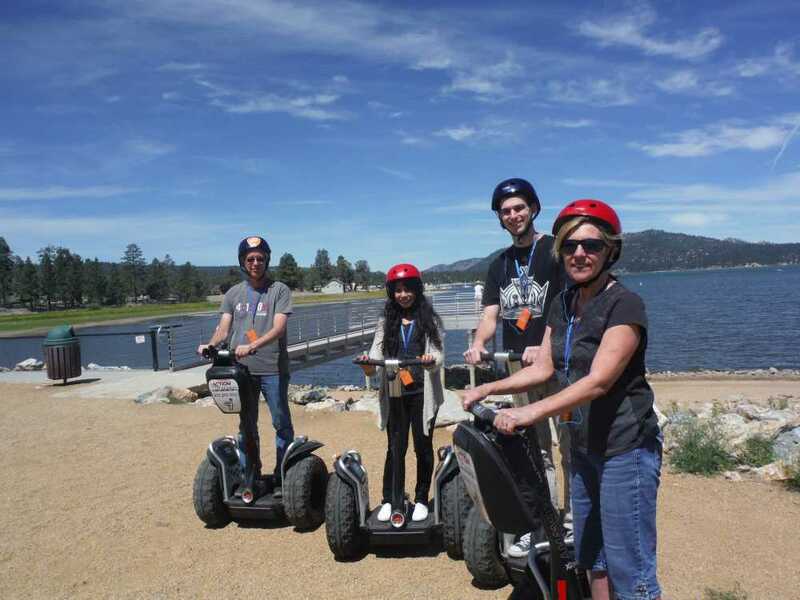 Action Tours offers several adventure tours to see Big Bear from different angles. Segways are a cool way to explore the town. Friendly guides share fun facts and point out landmarks, such as Big Bear’s first post office. The log house is where President Richard Nixon and his family stayed on vacation. Action tours also offers zip lining, fly boarding and tree rope climbing. This venue has been around for a long time for good reason – it’s fun! Activities include a double water slide, an 18-hole miniature golf course, go-karts, and bobsleds. In fact, the bobsleds alone are reason to visit. A chairlift brings riders to the top of the hill. From there, each rider controls his or her own bobsled down tracks with banks and straightaways. Control your speed with the handbrake. 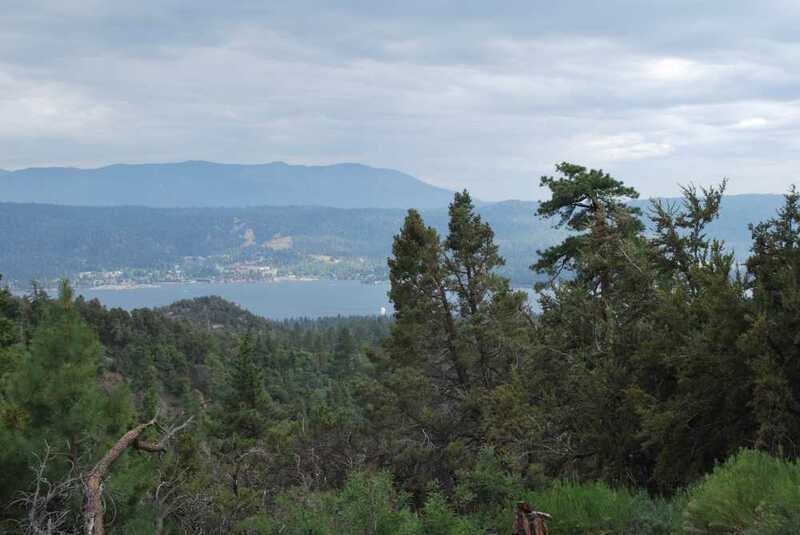 For amazing views of Big Bear Lake, ride the Scenic Chair Lift to the top of Snow Summit. Walk around, admire forest and lake views, and have lunch at the Skyline Taphouse (check hours in advance). You can ride the chair lift back down. Or hike or mountain bike to the bottom. 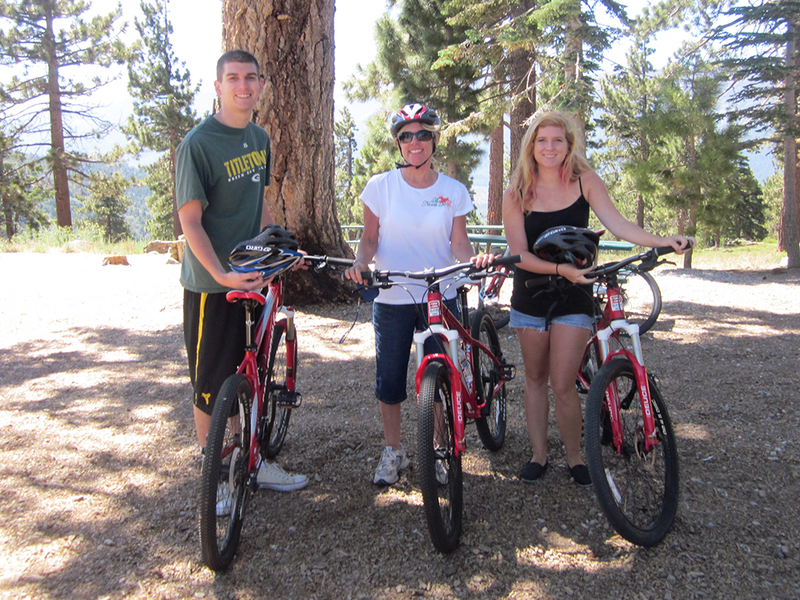 Mountain bikers can rent bikes in Big Bear Lake Village. My kids did fine riding down; I was white-knuckling it. But I made it without any falls. Visit the dog-friendly Big Bear Discovery Center on the North Shore for area information and programs. The center offers guided lake tours, nature hikes, interpretive programs, children’s crafts, and campfire programs. The canoe and kayak tours are a lot of fun. Guides lead the way to cranes, ducks, coot, geese, herons, egrets and other shorebirds on the lake. You may even see a bald eagle when these majestic creatures migrate to Big Bear to hunt for fish and water fowl. After a day of summer activities on the water or hiking, we like to take a stroll through the village. It’s a casual gathering place with sitting areas, locally-owned shops and a good selection of restaurants. These include international cuisine as well as comfort food, and sweet shops. The North Pole Fudge & Ice Cream shop is among our favorites. The village is also a good place to find locally made crafts and unique gifts. They make perfect souvenirs of our Big Bear Lake family vacation. Thank you for all the detail. As a mom who has been busy working and trying to plan a last minute trip before the kids head to college and grade school it’s been EXTREMELY helpful! Thank you! Nice you balance all the active ideas with a “stroll” in the village! The Tarzan boat sounds like fun, and a new feature for anywhere. I haven’t seen one yet.